Community Publisher Cheryl Brown scores a major upset She went against the grain and scored an upset ­victory against a candidate who had the backing of the Inland establishment. 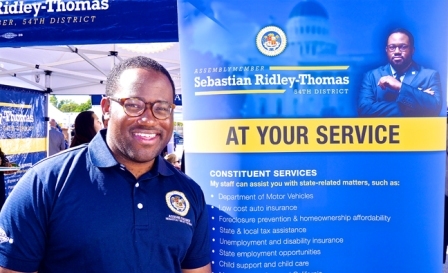 Assemblymember Sebastian Ridley-Thomas recently held the grand opening of his relocated district office, which is now renamed the Constituent Services Center. The community event also featured a resource fair. The Assembly­member relocated his constituent’s office from Culver City to the Crenshaw District. The Constituent Services center fair offered an “At Your Service” opportunity with valuable resources for community members, as service providers spent the day giving advise on issues from health services and housing, to educational resources and employment. Margo Thomas, executive director, Crenshaw Health Partners, says service events such as these help build the community. “Through Sebastian Ridley-Thomas’ vision, Crenshaw Health Partners, as we are representing Cover California and other health-based ­organizations, are able to come out here and actually communicate with the general public and get them the info they need to live a better quality of life, said Thomas. Other organizations included Kaiser Permanente, US Bank, THE Health and Wellness Centers, voter registration information, . Sebastian stated, “The reason why I wanted to relocate here was because of the community infrastructure that was here. Tom Bradley Post Office, the Diane Watson Center, the Sentinel Newspaper, the Baldwin Hills Crenshaw Plaza, the Social Security office and the One United Bank.” He continued, “This is a corridor that has a lot of foot traffic, the DWP building, even the Krispy Kreme; I wanted make my office an easy place to access state services.” Some of the services include DMV, MediCal and EDD. The constituents service office will provide many resources and referrals services, helping individuals navigate through state services and resources. Sebastian shared, “you have a complaint about an attorney or judge you can go to the state bar or the judicial commission of state performance. If you want childcare, we work with organizations like Crystal Stairs, if you have a child or an adult who is mentally disabled. we have regional centers. The speakers reflected his vision as LAUSD George McKenna spoke as well as Councilmember Curren Price, State Treasurer and CA Governor candidate John Chiang; as well as 2nd District Supervisor Mark Ridley Thomas and Congress member Karen Bass also attended the opening. The event served as a one-stop-shop for families to learn about important community resources. Entertainment was provided, including musical performances from Crenshaw High School’s Marching Band and Susan B. Miller’s Dorsey High School Marching bands, Line Dancing with the Nubian Boot Scooters and R&B Singer Jordan Parker. Free lunch was also provided from Buffalo Wild Wings and Ham Ji Park Korean Barbecue Restaurant. The entire event was emceed by KJLH Radio Station and included a rally lead by the Assemblymember. Assemblymember Sebastian Ridley-Thomas relocated Constituent Services Center is located at 3847 Crenshaw Blvd. Los Angeles, CA 90008. For more info visit the website https://a54.asmdc.org or call (323) 291-5441.